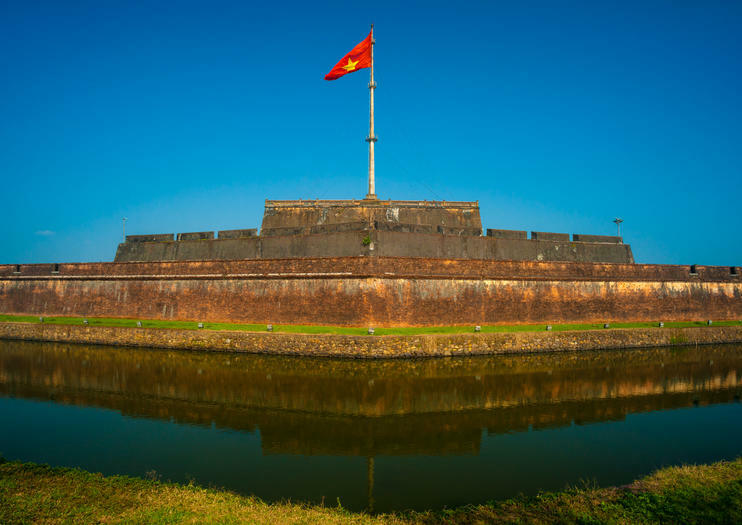 The main focal point of the Imperial City, Hue’s Flag Tower greets visitors upon arrival at the Citadel, sitting opposite its main entrance and facing out across the river. The tower was built at the beginning of the 19th century during Emperor Gia Long's reign, although the flag staff has been destroyed and rebuilt a number of times since. This is Vietnam's tallest flagpole. The yellow flag of royalty was the first to fly here, before being replaced by many others throughout Vietnam's colorful history. During the Viet Cong occupation in the 1960s, the flag of the National Liberation Front flew from the Flag Tower for more than three weeks. The tower itself is made up of three platforms, with the third featuring eight canons and a sentry box at either end. The Flag Tower in Hue sits right opposite the main entrance to the Citadel, overlooking the river. Although visitors are free to take photographs, they are no longer permitted to climb up on the structure. Travel around Huế by cycle rickshaw. Local riders will take you from your hotel around Huế’s Imperial City, the former political, religious, and cultural centre of the Nguyen Dynasty until 1945. Once home to the Imperial Family and Emperors of Vietnam, you’ll see the Citadel, Nine Holy Cannons, Nine Dynastic Urns, The Flag Tower, Ngọ Môn Gate, Thai Hoa Palace, and the Forbidden Purple City. See where the Nguyen Dynasty ruled Vietnam during this half-day tour of the Imperial City of Hue and the Forbidden Purple City. Your informative guide provides a glimpse of this major historical complex, once a foremost cultural and religious center and now a UNESCO World Heritage site. You’ll ride a dragon boat on the Perfume River to Thien Mu Pagoda (Heavenly Lady Pagoda) and visit the Hue Royal Antiquities Museum. Round-trip hotel transport by minivan included. Add a twist to your sightseeing tour by visiting Hue’s UNESCO-listed landmarks by traditional cyclo. Hop on-board with your private guide for a 4-hour tour, gliding around the serene Tinh Tam Lake and exploring the highlights of Hue Imperial City. Learn the rich history and heritage of the one-time capital as you marvel over landmarks like the Flag Tower, Noon Gate and the Nine Dynastic Urns. This private tour also includes hotel pick-up. Discover the top attractions of Hue by cyclo on this private full-day tour. In the morning, your guide shows you the treasures of Hue Imperial City (aka Forbidden City) and Thien Mu Pagoda. Return to the city by dragon boat and have a Vietnamese lunch at a local restaurant. In the afternoon, learn about the Nguyen dynasty as you visit the Tomb of Tu Duc and theTomb of Khai Đinh. Your tour includes lunch, guide and cyclo driver, boat tour, entrance fees, and hotel pickup and drop-off. Lovers of good food will enjoy this sightseeing tour, which includes a cooking lesson. Visit many of the must-see sights of Hue, stopping in the middle of the day to prepare and eat a meal at the Thanh Hoan Eco Restaurant. This is the ideal way to get the most out of a short time in Hue, as a variety of sights and experiences are included, from historic sights to gastronomic delights. Get a personal introduction to a one-time imperial capital on a 4-hour, private tour of Hue by a traditional, pedal-powered cyclo. Take in the view from Tinh Tam Lake, then see the historic landmarks inside the Imperial City, a UNESCO World Heritage Site. This 4-hour tour includes entrance fees, as well as pickup and drop-off at your centrally-located hotel in Hue.